This past June a federal judge ordered the relocation of thousands of prisoners from two prisons in the San Joaquin Valley in California to protect imprisoned men against a small fungus, Coccidioides immitis, that could infiltrate the gated and locked Pleasant Valley and Avenal state prisons and continue to cause isolated cases of a debilitating illness, valley fever. 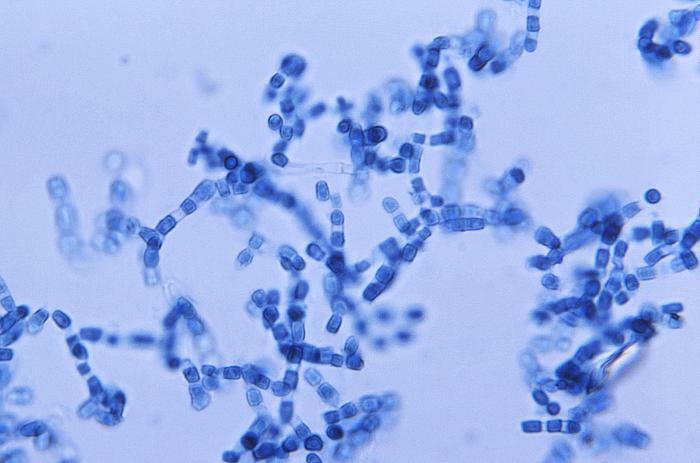 A photomicrograph of the arthroconidia of Coccidioides immitis showing their characteristic barrel shape. Image: CDC/Dr. Lucille K. Georg. The fungus, commonly referred to as cocci, has an ancient relationship with the desert soil of the western United States, as much a part of the ecology and flora of the San Joaquin Valley and the “lower Sonoran life zone” as the equally hardy saguaro, creosote and prickly pear cacti that dot its landscape. This is an old New World infection that has plagued various communities in the American southwest for centuries now, from pre-Columbian Indians to Army Air Corps servicemen during WWII to Californian prisoners. The soil-dwelling pathogenic fungus is a hearty one, entering a dormant stage during periods of drought. Upon the arrival of rain, cocci transforms into vertical strands of spores called hyphae containing the barrel-shaped infectious units of the fungus known as arthroconidia. These arthroconidia take flight when the soil is jarred by earthquakes, wind, or human tampering. When the airborne fungus is inhaled and delivered to the lungs, the arthroconidia transform into spherules, increasing in girth and growing daughter cysts tightly packed within its structure. In some cases, these spherules can rupture and release endospores that can travel throughout the body via the blood or lymph to infect the lungs, heart, and brain leading to the serious form of disease, disseminated cocci. Regions of the world with endemic coccidioidomycosis, areas with favorable environmental conditions allowing C. immitis to complete its life cycle within the soil. Image: US Geographical Survey. Click for source. The fungus resides in the topmost 30 centimeters of soil, a strata invariably dislodged by construction workers seeding new homes in the arid region, farmers and agricultural workers dislodging hard-won fruits and vegetables from the soil, and archaeologists sifting for relics of ancient Indian civilizations (1). In fact, cocci is a full-blown occupational hazards for those Indiana Jones-types “probing, scraping, excavat[ing], and screening” artifacts and otherwise tooling around in the fungi-laden desert soil of the southwestern United States (1). The “sandy soil texture, alkalinity, and organic and inorganic elements resulting from the accumulation of human refuse” within these very same prehistoric sites create a set of conditions perfect for the proliferation and growth of cocci mold (1). Several cases of valley fever in the US that have been specifically associated with archaeological digs arise from the excavation of prehistoric Indian sites and burial grounds (2). In the summer of 1970, 105 students from three California University archaeology programs were infected one summer as they excavated prehistoric middens, areas of known human waste and refuse; this was out of a total number of 150 students, representing a staggering 70% attack rate (1). Two years later, 39 archaeology students affiliated with a summer program at California State University at Sacramento were infected as they excavated the ancient ruins of the Yana people in Red Bluff, CA (3). In 2001, ten individuals from an 18-person team of students and archaeologists working at Dinosaur National Monument in northeastern Utah had to seek medical treatment for severe respiratory symptoms and a pneumonia-like illness caused by cocci infection (4). The kicker? Many of the pre-Columbian sites and societies such as the Hohokam, Singagua, and Anasazi Indians that have been investigated by archaeologists may have suffered from valley fever as well. The remains of 1000-year-old human and canine skeletons have been found riddled with lytic lesions targeting the spinal vertebrae and the scapula, indicative of disseminated cocci infection. Both paleopathological and paleoenvironmental studies suggest that the men and women that lived in prehistoric California and Arizona suffered from valley fever, a product of the same dusty, arid environmental conditions that exist today in the southwestern US (5). As the authors of the textbook Dangerous Places: Health, Safety, and Archaeology note on the dangers of cocci infection among archaeologists, it is “ironic that the excavator and ‘excavatee’ can end up sharing the same disease experience and hence have something in common with each other.” (1) (A bit of a flippant remark for what can be a serious disease, but it should be noted that this is not “ironic,” only sadly coincidental.) They also mention that those individuals who show positive antibody skin tests to cocci should be excluded from investigative digs and field work, for fears of aggravating an existing infection. But who is champing at the bit to live the life of an armchair archaeologist, theorizing about the whereabouts and whyabouts of dusty artifacts rather than getting one’s hands dirty? A United States map showing the number of coccidioidomycosis-associated deaths and age-adjusted rates per 1 million persons from 1990–2008. Image: Huang et al. (2012) Coccidioidomycosis-associated Deaths, United States, 1990–2008. Emerging Infectious Diseases. 18(11): 1723-8. Click for source. It is this same inescapable fact of the ubiquitousness and hardiness of cocci in the San Joaquin Valley soil that prisoners and prison officials in the region have been facing this summer. For reasons still unknown after a century of research, indigenous Indian Americans, Hispanics and persons of Asian or African descent are at the greatest risk of the serious form of infection, disseminated cocci. As prison officials have been debating this summer on just how and where to move thousands of men at the greatest risk of infection, both geographically and genetically susceptible, an epidemic of valley fever that affects nearly 20,000 people every year silently continues. And for those infected – archaeologists or prisoners or Indians living a millennium ago – the illness can be as unrelentingly ruthless as the San Joaquin Valley, as imprisoning as the Avenal State Prison. In late June, a federal judge ordered over 3000 inmates from both Avenal and Pleasant Valley State Prisons to be moved due to a “public health emergency” caused by persistent valley fever infection within the population. In the past seven years, 40 inmates have died from the infection and a class action lawsuit has been filed seeking medical care from the state for those inmates infected in the prison. An excellent fact sheet on cocci and valley fever from the Institute for International Cooperation in Animal Biologics and The Center for Food security and Public Health. It downloads as a PDF. Want to scratch around in the dirt and do archaeology fieldwork? Here’s a PDF on operational guidelines and risk management strategies for geological fieldwork in areas endemic for cocci from the US Geological Survey. 1) DA Poirier and KL Feder (2001) Dangerous Places: Health, Safety, and Archaeology. Praeger: Westport, Connecticut.